Well, I’ve eaten my words more than a few times, and I’d gladly eat the ones with which you describe butternut squash soup. SOUNDS delicious. But anything like a squash, rutabaga et al (but not eat all) is anathema to my tastebuds. Has the appearance of pre-masticated food and the taste to me is not far behind. Perhaps surprisingly, I do like a high-class vegetable soup. There’s a place in central Florida with an airstrip and a few outbuildings that look like a fairytale village (might be Lake Wales). Anyway, I ate a breakfast there years ago that included a Romain soup that is to die for. Yeah, doesn’t sound like breakfast, and I think the tab was around $70, but it was the best soup I’ve ever tasted. Also like pea soup, tomato soup, and mushroom soup as part of stroganoff. I like to cut up shrimp and add to tomato soup, ditto black forest ham from Whole Foods in pea soup. BS soup is savored in your picture and description, but I leave the repast to “seasoned” soup-er gourmets like you and your more tasteful readers! Thanks, Sully! I like a nice chunky vegetable soup, too. But there are times when a perfectly smooth (or "pre-masticated") soup is called for! :D I think I'll start calling my immersion blender the "premasticator!" Amy, thank you! Glad you like it! I just purchased all the ingredients for your Cabbage soup we love so much and now it looks like I'll have another soup to make next week. Cool! It is soup season after all. We're swapping soup recipes! This looks great. Richard, thank you so much! Hope you like it, too! Thanks, Corrin! I'm glad to have more options for when Soup Weather really finally arrives! Oh this sounds delicious. I make it every fall, but put hot curry from Penzeys in mine. Now you have me curious about trying it with maple syrup! Thanks, Judy! Try it and let me know how you like it! We must have been on the same culinary wavelength, Jean. I had some butternut squash soup for the dinner yesterday and I am going to make some more for today. This time I am going to add an apple in it. Thanks for the inspiration! That a lovely receive...thank you. I bet it tastes delicious. Hmmmm, we love butternut soup but I'm not sure I'd be able to get the Great Scot to try this... if it bears even a passing resemblance to something that might be pumpkin-ish he automatically hates it. *I* would love it though! My recipe is more on the savoury side, but not overloaded with strong flavours. I absolutely LOVE the idea of using potatoes rather than cream and will definitely be trying it; thank you! My sister makes her soup with maple syrup and she begged me to try it. She visited not too long ago with three bottles of her homemade maple syrup. I told her I didn't want to waste it on soup and she told me I'd live to regret it if I didn't try it at least once. I laughed when I saw your recipe and I promise to try it! Angie, that is so cool! I hope you like the apple. It really adds something, I think, without adding too much sweetness. Margaret, thank you! Even my husband likes it! Thanks, Jacqueline! Maybe tell the Great Scot to close his eyes, then sneak him a spoonful! Maureen, and here I thought I'd come up with something new with the maple syrup! Nothing new under the sun! But, really, just a little bit gives it a certain something without adding much sweetness. If you try it, let me (and your sister) know how you liked it. A restaurant here in Fredericksburg serves a similar soup on their menu during the fall and winter. I have never tried it and I guess it's time I used your recipe to give it a shot. Thanks for posting it! Thank you for this delicious recipe Jean. The presentation is so pretty! Denise, thank you so much! My mother always did beautiful presentation. I wish I had photos of some of her food. Yummy sounds like we need to make some of this stuff soon. Now it just needs to cool off here in the Desert to usher in soup season. Love your food photos too!! Thanks, Unknown! It needs to cool off EVERYwhere -- this has been some crazy weather this year! Wo!!!! !hold your horses there just one minute, Jean. That is NOT food,that is art!!!!!!!Ha! Ha! Thanks, Tony! You should've seen my mother's food -- she *really* knew how to make it look good! Looks delicious! Ultimate comfort food!Thanks for sharing on Creative K Kids’ Tasty Tuesdays link up. I have also pinned your recipe to our tasty Tuesday's Pinterest Board. Hope to see you back next week! Dina, thanks! The link up is such fun -- love checking out all the different posts. A delicious looking soup which is perfect for the colder weather we're having, including the snow flurries yesterday. I like the idea of adding apple and have a couple of squash from the last farmers market before it ended. Judith, thank you and Happy Autumn to you! I've always loved the poetic sound of "snow flurries." Jean, your squash soup sounds and looks amazing! I love squash, sweet potato, and my own cream of vegetable soup which I learned to make in Home Ec. I like the idea of adding apple to the squash. I would think that would give it a little extra something. Thanks for sharing and stopping by. Jean, I love butternut squash soup and have been wanting a good recipe. Can't wait to try it! 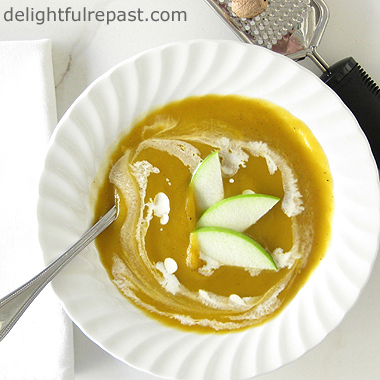 Jean, I love, love, love butternut squash soup, and this recipe sounds delish! Sandi, thank you! I never had a home ec class, but I'm sure it would've been great fun! Jann, thanks! Let me know how it turns out for you! Carol, thanks so much! Hope all is well with you! Thanks, Tandy! I'm the same way. If my husband doesn't like something, I rarely, if ever, make it. One of my favourite soups. I do love how you have added the crisp apple on top. Thank you, Sara! Yes, I like the tart and crisp accent to the smooth and creamy texture.